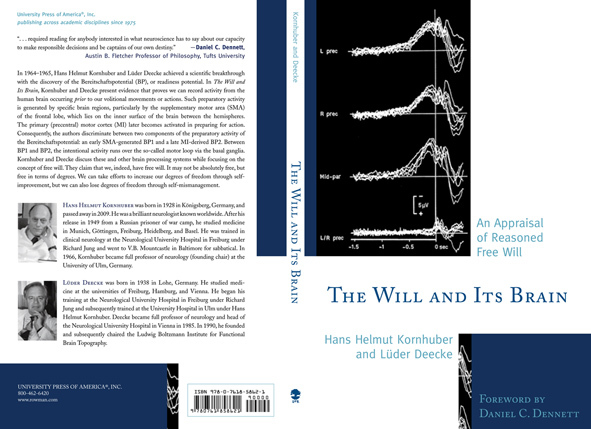 Kornhuber HH, Deecke L (2012) The will and its brain – an appraisal of reasoned free will. In 1964-1965, Hans Helmut Kornhuber and Luder Deecke achieved a scientific breakthrough with the discovery of the Bereitschaftspotential (B.P. ), or readiness potential. In The Will and its Brain, Kornhuber and Deecke present evidence that proves we can record activity from the human brain occurring prior to our volitional movements or actions. Such preparatory activity is generated by specific brain regions, particularly by the supplementary motor area (S.M.A.) of the frontal lobe, which lies on the inner surface of the brain between the hemispheres. The primary (precentral) motor cortex (M.I.) later becomes activated in preparing for action. Consequently, the authors discriminate between two components of the preparatory activity of the Bereitschaftspotential: an early S.M.A.-generated B.P.1 and a late M.I.-derived B.P.2. Between B.P.1 and B.P.2, the intentional activity runs over the so-called motor loop via the basal ganglia. Kornhuber and Deecke discuss these and other brain processing systems while focusing on the concept of free will. They claim that we, indeed, have free will. It may not be absolutely free, but free in terms of degrees. We can take efforts to increase our degrees of freedom through self-improvement, but we can also lose degrees of freedom through self-mismanagement.